We cordially invite you to attend the public lecture Curating? Corating! by Swiss curator and author Daniel Morgenthaler. !Mediengruppe Bitnik, Delivery for Mr. Assange, Helmhaus Zürich, 2014. 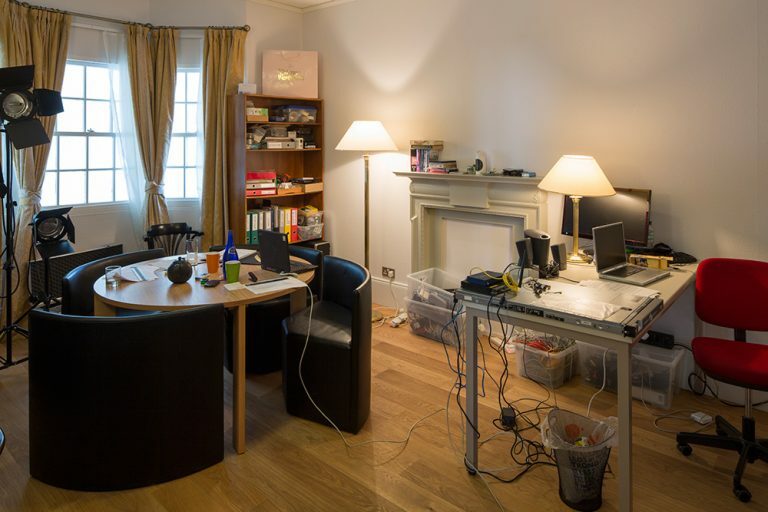 Replica of Julian Assangeʼs office at the Ecuadorian embassy in London. Photo: FBM Studio. It is a bit like picking up weapons in the digital architecture of an ego shooter game: Ancient Greek and Roman orators memorized their speeches by placing portions of content in different rooms of an imagined or remembered architectural structure. While giving their speeches, they would make their way through this brain architecture, gathering up contents along the way, aiming for the exit – i.e. the finale of their speech. As curators, we are – usually – not working in imagined architectures, if, then maybe in digital ones. But perhaps there are certain parallels between organizing speeches using the “method of loci” and organizing exhibitions in the chain of rooms that constitute an art space. And maybe exhibition making is also a kind of mnemotechnology: placing content in rooms, along the logic or rhetoric of a certain topic. What can curators learn from orators, ancient or contemporary? Are exhibitions of contemporary art maybe less a tool of memory – that’s more the thing of historical museums – but of mnemory, with an n? Places of thinking art, of rethinking art, of memorizing tendencies? Literary theory is widely – and sometimes too generally – applied to arts. Could the principles of rhetoric be applied to curating, to more effect? These and other questions will be discussed in the context of future and past exhibitions at Helmhaus Zürich. Daniel Morgenthaler (1978) has studied English, German and Philosophy in Zurich and Sheffield. Since 2011 he works as a curator at Helmhaus Zürich. Exhibitions include Talk to the Hand, 2013, !Mediengruppe Bitnik – Delivery for Mr. Assange/Christian Waldvogel – unknown, 2014, Asia Andrzejka Naveen – Mas cerca/De La Fuente Oscar De Franco – Bluecore, 2015. As a freelance author, he contributes to exhibition catalogues, magazines and newspapers like Kunstbulletin, Züritipp and Apartamento. He regularly teaches at the MAS Curating and the MFA at the Zurich University of the Arts. Together with critic and curator Aoife Rosenmeyer and supported by Pro Helvetia, he established Crritic! a workshop programme concerned with critical writing in Switzerland, in 2014. The lecture is organized by World of Art/SCCA–Ljubljana and supported by City of Ljubljana – Department for Culture and Embassy of Switzerland.